Muffins are practically a food group in my house. The perfect after-cereal breakfast finisher, an ideal grab-and-go snack and a great mid-afternoon pick me up, we eat them at all hours of the day and night. We have a few favourite recipes that I make time and again, but every so often, I want to shake things up a little. Perfectly ripe pears from Warner’s Farm in this month’s Farmers’ Feast basket from the Ottawa Farmers’ Market were the inspiration for creating this recipe, which is loosely based on my friend Andrea’s fabulous pear-gingerbread cake. I enjoyed one (or more…not admitting to anything) hot out of the oven with a cup of delightful Ginger Lime Sensation Rooibos tea from DiversiTea, also at the Ottawa Farmers’ Market. Not only are these muffins absolutely delicious, but they’ll make your house smell fantastic and they freeze beautifully. 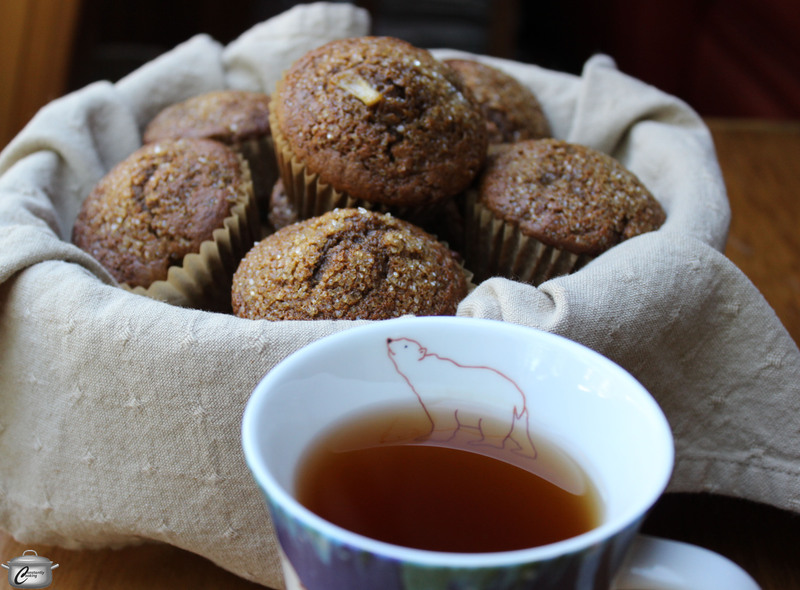 Fragrant with spices and studded with diced pear, these muffins are incredibly moist and delicious. Line 16 muffin cups with paper liners (use the parchment ones if you can find them – they’re fantastic). Whisk flours, sugar, baking soda and powder, cinnamon, ginger, cloves, and salt together in a large bowl. Put beaten eggs in a separate bowl; stir in buttermilk, molasses, and canola oil until smooth. Mix buttermilk mixture into flour mixture until batter is just moistened; fold in pears and nuts (if using). Bake in the preheated oven until a toothpick inserted in the center of a muffin comes out clean, about 18 minutes. Remove from oven and let cool on a wire rack for a few minutes before serving. This entry was posted in Baking, baking, Breakfast, brunch, Entertaining, Fruit, Fruits, Fruits and vegetables, healthy, Local Food, Make Ahead, Muffins, Ottawa Farmers' Market and tagged baking, breakfast, cinnamon, cloves, DiversiTea, Farmers Feast, ginger, gingerbread, molasses, muffins, Ottawa Farmers' Market, pears, snack, snacking, sugar, tea, Warner's Farm, whole wheat. Bookmark the permalink.